The spiced sausage meat is a welcome addition to this classic snack! They taste absolutely delicious – maybe the best I’ve ever tasted! 1. Melt the butter in a frying pan and gently fry the shallots and garlic for 5 minutes or until softened. 2. Add the shallots to a bowl with the sausage meat, parsley, sage and curry powder. Mix through and season to taste. 3. Meanwhile soft boil the eggs placing them in a pan of boiling water and cooking them for 6 minutes. Cool them in cold water and peel them under the water. 4. To assemble, place a sheet of cling film on a board, put a ball of sausage meat on top and flatten enough to cover the whole egg. Place an egg in the middle, then draw up the ends of the cling film and massage the sausage meat to cover the egg evenly. Repeat this with the rest of the eggs. 5. Place the flour, eggs and breadcrumbs on three separate plates. One at a time roll each Scotch egg in the flour, then dip into the egg and then into the breadcrumbs to cover. Repeat this with the rest of the eggs. Now place in the refrigerator for 20 minutes. 6. In a deep-fryer heat the oil to 170°C, test the oil is ready by dropping in a piece of bread. If the oil sizzles and the bread turns golden in less than a minute the oil is ready. 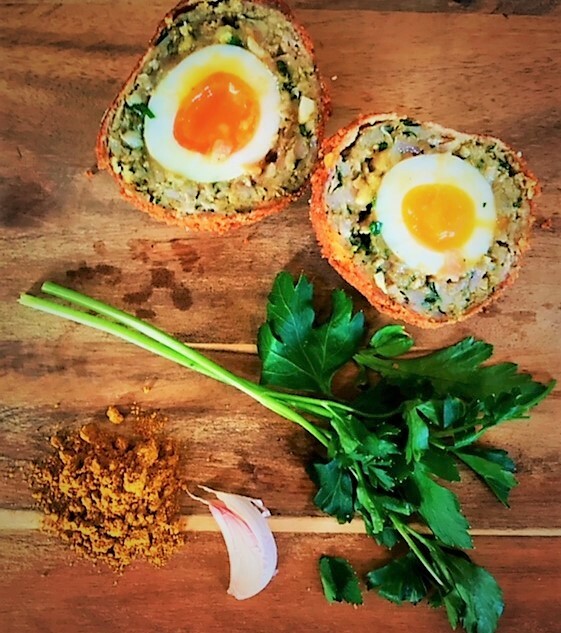 Place the Scotch eggs into the oil and fry for 5-6 minutes or until evenly browned. Fry in batches and keep them warm in a low oven. 7. Remove with a slotted spoon and drain on kitchen paper. Enjoy!